Temporomandibular Joint Dysfunction is epidemic. 35 million Americans are diagnosed with TMJ, 95% of them women – and many more undiagnosed and asymptomatic. In fact, it is currently hypothesized that the numbers of asymptomatic TMJ are nearly as high as those that have typical symptoms. This blog article will focus more on asymptomatic TMJ, as it is often misdiagnosed, or totally overlooked due to its array of seemingly unrelated symptoms. First, just to clarify, TMJ Dysfunction is often characterized by pain related symptoms, such as jaw pain, headaches, ear pain, ringing in the ears, and neck pain. 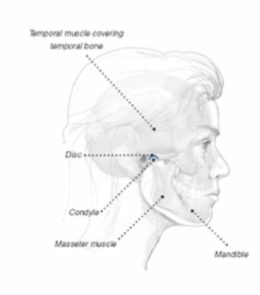 There is no definitive approach to treatment for TMJ, but there are a variety of approaches – some very conservative, such as ice and self care jaw exercises; and others that actually change the structural jaw dynamics. A well-positioned, centralized jaw joint does not create movement or jaw sounds that can be felt in the ear canals. If jaw sounds can be felt with pinkies in the ear (see photo number 1), this will often cause a cascade of body imbalance and discomfort from the base of the skull downwards to the pelvic bowl/hip area. • Visual changes in your jaw position when both opening and closing. • Larger muscle development on one side of the mouth than the other. • Shrinking or deformity of the jaw joint, as the whole body begins to respond to changes coming from the jaw. • Osteoarthritis in other joints – and not just in the jaw and head region, but also throughout the body. Dr. Steven Swidler, Holistic Dentist and TMJ Practitioner, located in Tucson, Arizona, created a model of working with TMJ greater than 20 years ago, which he coined Body/Jaw Alignment™. In the last 10 years, we have combined our approaches, adding Functional Yoga Therapy™ and it’s structural movement therapeutics to Dr. Swidler’s model of treating the jaw by working with the whole body. At first, as a Yoga Therapist, I thought this approach and theory would benefit a small percentage of my clients. However, as I continue to assess and facilitate treatment planning, I have found a surprising 80% of my clients to have underlying jaw conditions affecting other parts of their structure. Complaints of Hip pain or discomfort, sacrum or sacro-Iliac joint discomfort, issues in the knees, low back, shoulders and neck area. These symptoms are definitely broad, until we go to the jaw joint and do a simple differential assessment. Through this we find that there is often an imbalance in the client’s hip heights, and a correlation to an imbalance in how the teeth touch, or how the jaw misaligns with movement. Addressing not only the clients complaints of discomforts, but also the TMJ issues has increased the client’s return to balance, and much more quickly. This overlooked relationship of jaw/body issues in movement therapeutics models has proven to be a foundational missing link in successful treatment of overall body restrictions instead of just chasing symptoms. I find it to be a true paradigm shift in my work as a movement therapist. 2) Check your side hip heights in a mirror or with a friend – is one side different than the other? 3) Place a Q-tip or thin pencil between your front teeth, lining them up, while relaxing your jaw. Recheck your hips – do they balance to equal? We call this combined approach Fluid Body Dynamics, because it incorporates Body/Jaw alignment™ and Functional Yoga Therapy™ within an unusual but effective multidisciplinary team approach (TMJ Practitioner, Yoga/Movement Therapist, Bodywork Specialist). Fluid Body Dynamics utilizes the work of Dr. Swidler to address Body/Jaw alignment issues; and the work of Maria Mendola to facilitate correct functional movement patterns thus re-establishing the correct neural re-patterning of the body and resultant ease in the body. In the Southern Arizona area, Fluid Body Dynamics is currently hosted by Medicine Wheel Dental and Wellness Center. Find out more about Fluid Body Dynamics, and please contact us via this link and we will send out an informational packet.